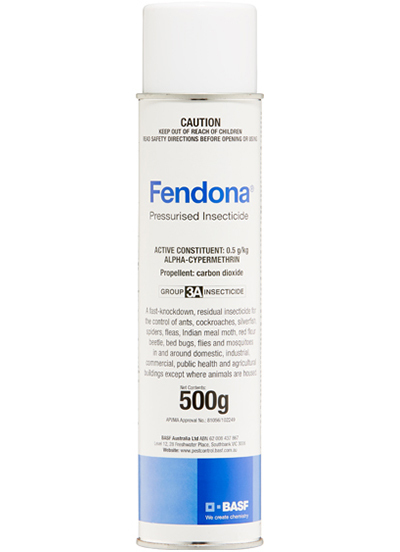 Fendona® is a potent and reliable insecticide that will quickly control a wide range of problem pests – including spiders, cockroaches and fleas – when it is applied as a surface spray in domestic, industrial and public health situations. The active ingredient in Fendona is so effective it will knock pests down in as little as 30 minutes and kill them within 24 hours. Fendona remains equally potent for months after application. Fendona® controls insects by acting directly on the nervous system following contact or ingestion. Fendona can be applied with a knapsack sprayer or other conventional spray equipment used to control public health pests. A higher volume of spray may be required on very absorbent surfaces. Premises about to be sprayed should be evacuated, then re-occupied as soon as spray applications are fully dry.